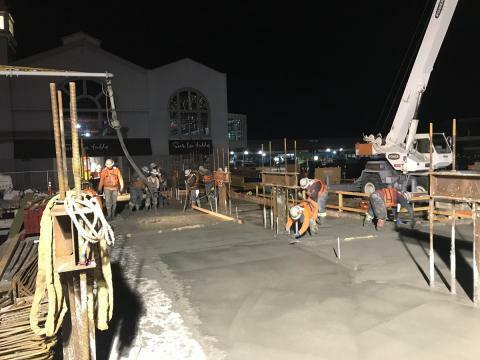 April 12, 2019: This week the contractor worked to install side forms for the plaza step build up and for the walls in deck pour #8 and deck pour #14. 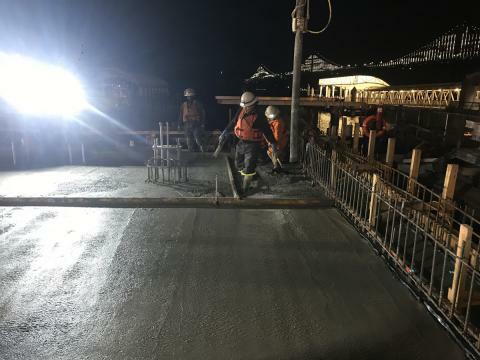 The contractor successfully poured concrete for deck pour #17, the end of deck pour #14, and the walls on the north side of deck pour #14. 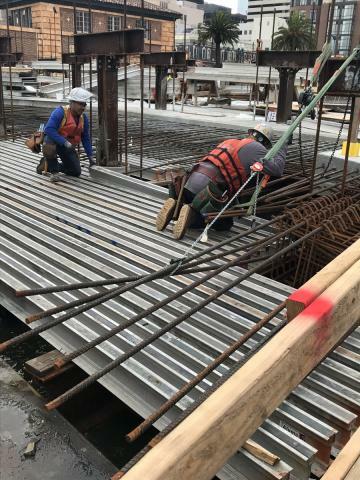 To prepare for deck pour #17 the crew finalized the installation of aluma beams, plywood, and pony walls; the rebar subcontractor continued the installation of rebar; and the electrical subcontractor installed the conduit for the light post. 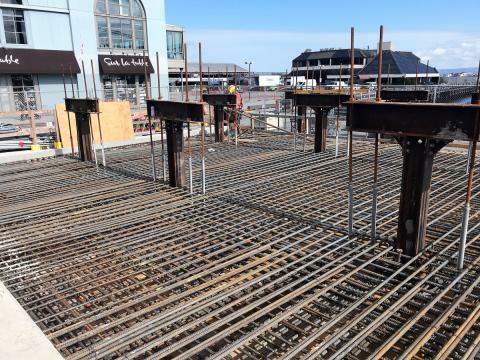 Over the next several weeks, the contractor is scheduled to begin to place formwork for deck pour #13 and deck pour #19, and complete punch list items related to Section 1. 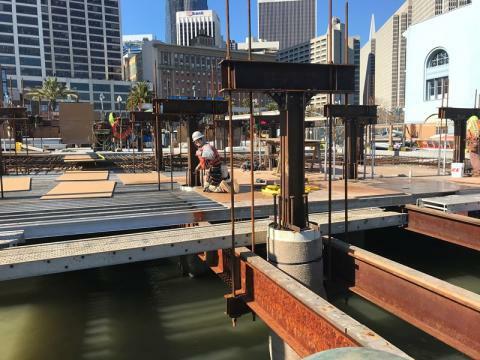 March 29, 2019: This week the contractor continued to demo excess concrete from the middle step on the west side of the plaza and continued stripping the falsework beams from Deck Pour #15 and Deck Pour #16. 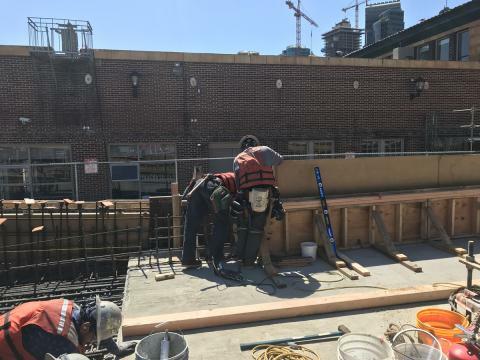 The crew then began the installation of aluma beams, plywood, and pony walls for Deck Pour #17. The crew also poured concrete for the plaza stairs and stripped the side forms. Over the next several weeks, the contractor is scheduled to continue to place falsework and formwork for Deck Pour #17, pour concrete for Deck Pour #17, and complete punch list items related to Section 1. 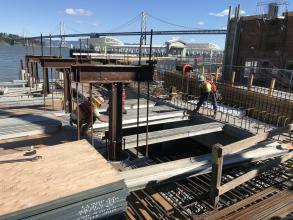 March 22, 2019: This week, the contractor continued to work in the Plaza and Gate E. Work included stripping of the soffit forms from Deck Pour #15 and Deck Pour #16, demo of excess concrete from the middle step on the West side of the Plaza, installing side forms and rebar for the stairs in the plaza, as well as drilling and bonding the rebar. 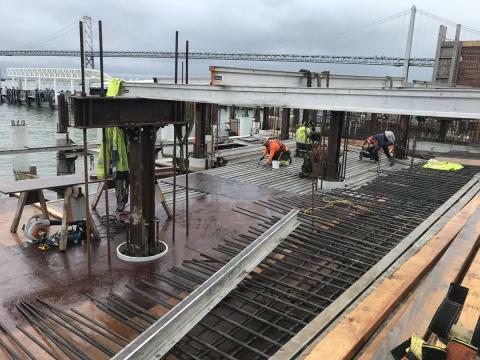 The crew began adjusting the falsework beams for Deck Pour #17 in preparation for the installation of aluma beams and plywood and removing the pile collars from the existing Gate E guide piles. Additionally, demo of the existing Gate E continued. This week in Section 1 the electronic subcontractors were onsite to work on getting the real time signs at Gate F and Gate G online and on adjusting the sliding doors on the Gate F Float. 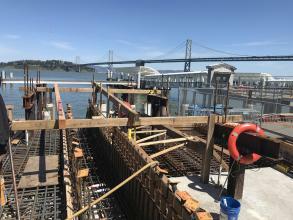 Over the next several weeks, the contractor is scheduled to place falsework and formwork for Deck Pour #17 in the plaza, pour concrete for Deck Pour #17, continue the demo of Gate E; including the demolition of the portal and removal of the piles, and complete punch list items related to Section 1. 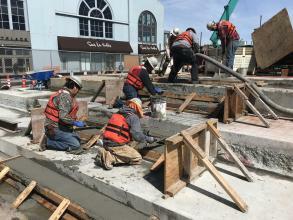 March 15: This week the contractor and their subcontractors continued work in the Plaza. 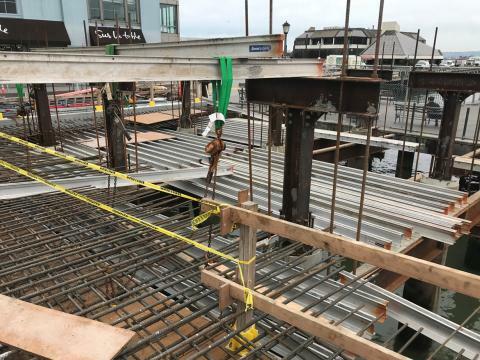 The contractor began stripping the cold joint forms between Deck Pour #16 and Deck Pour #17, stripping the soffit forms from Deck Pour #15, and installing side forms and rebar for the stairs in the plaza. 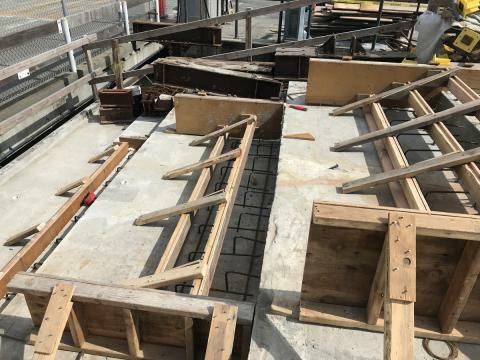 Demolition work continued as the Gate E Float was removed and brought to Alameda for refurbishment. 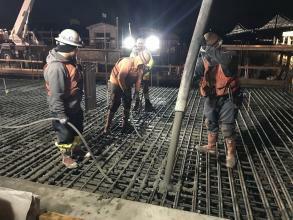 Over the next several weeks, the contractor is scheduled to place falsework and formwork for Deck Pour #17 in the plaza, pour concrete for Deck Pour #17, continue demo of Gate E (including demolition of the portal and removal of the piles), and complete punch list items related to Section 1. 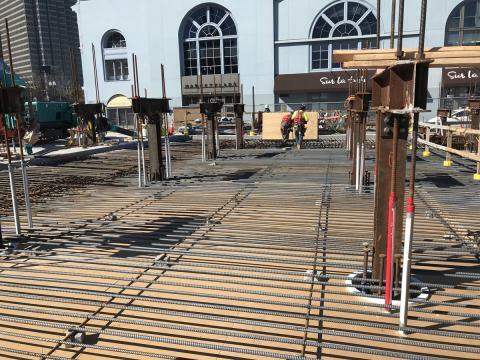 March 8, 2019: This week work continued in the plaza. The contractor continued to place plywood for the cold joint between Deck Pour #16 and Deck Pour #17 and began placing formwork for the stairs. 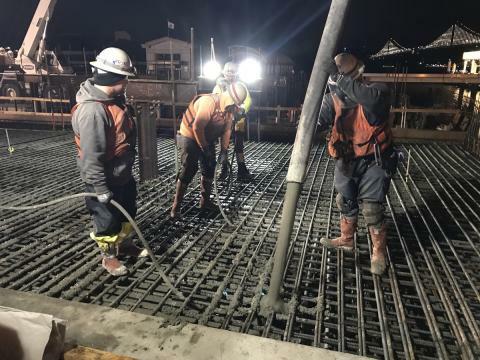 The rebar subcontractor finished installing rebar for Deck Pour #16 and the contractor successfully placed concrete for Deck Pour #16 in the lagoon. 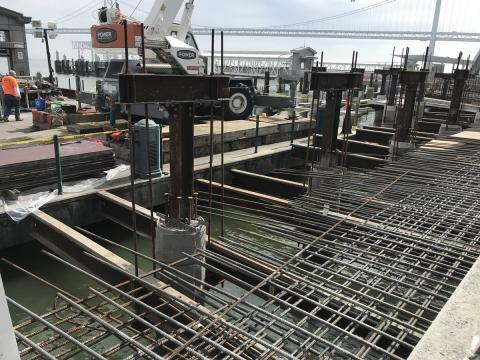 Demolition also continued at the existing Gate E. The contractor continued removing handrails and section of guardrail from the Gate E float and gangway and removed the existing Gangway from Gate E.
Over the next several weeks, the contractor is scheduled to place falsework and formwork for Deck Pour #17 in the plaza, pour concrete for Deck Pour #17, continue the demolition of Gate E; including the removal of the float, and complete punch list items related to Gates F & G.
March 1, 2019: This week the contractors and their subcontractors continued work in the Plaza. 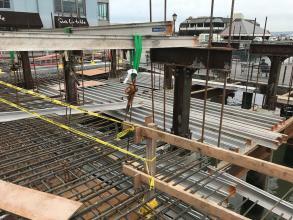 The contractor began to place plywood for the cold joint between Deck Pour #16 and Deck Pour #17. 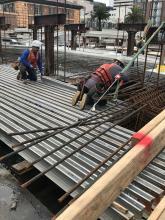 The surveying subcontractor continued surveying the plaza stairs, while the rebar locating subcontractor began locating rebar in the steps of the Plaza. Demo continued at the existing Gate E with the contractor removing handrails and a section of guardrail from the Gate E float and gangway. 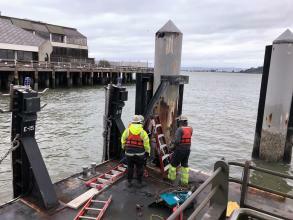 The contractor also continued removing the pile caps from the guide piles around the Gate E float. Also at the Gate E portal the contractor began removing sections of granite that made up the compass on the west side of the Portal. Over the next several weeks, the contractor is scheduled to place falsework and formwork for Deck Pour #17 in the plaza, pour concrete for the Deck Pour #16, continue demo of Gate E, and complete punch list items related to Gates F & G.
February 22: This week the contractor continued to place aluma beams, plywood and bottom mat of rebar for Deck Pour #16 and began stripping the soffit forms from Deck Pour #15. 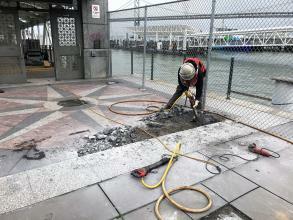 Demo began at the existing Gate E this week. The contractor began removing handrails and section of guardrail from the Gate E float and gangway and began removing the pile caps from the guide piles around the Gate E float. Over the next several weeks, the contractor is scheduled to place falsework and formwork for Deck Pour #17 in the plaza, pour concrete for Deck Pour #16, continue the demo of Gate E, and complete punch list items related to Gates F & G.
February 22, 2019: This week the contractor continued to place aluma beams, plywood and bottom mat of rebar for Deck Pour #16 and began stripping the soffit forms from Deck Pour #15. 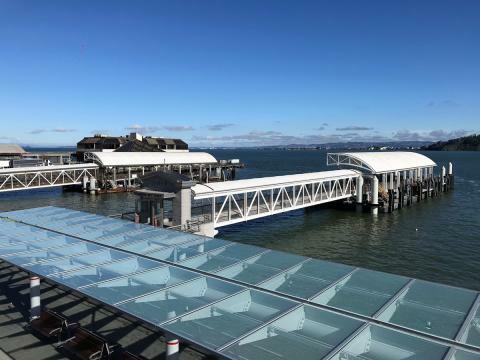 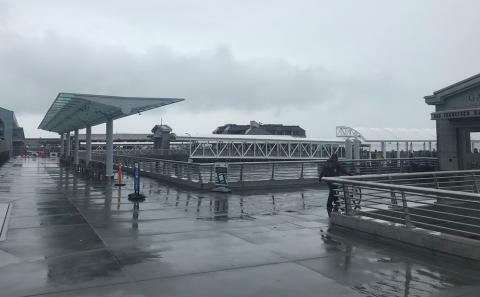 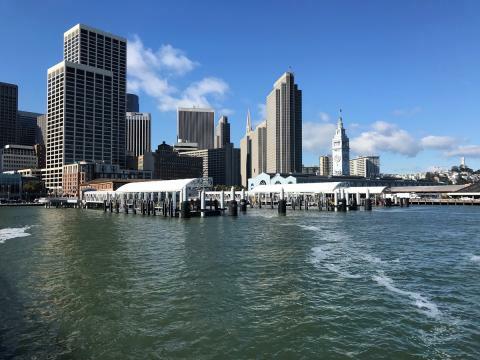 February 15, 2019: This week work on Gate F continued, including power washing and cleaning the float and gangway and touchup paint on the piles, pile collars, float, gangway, fenders on the Gate F float, and the promenade canopy. 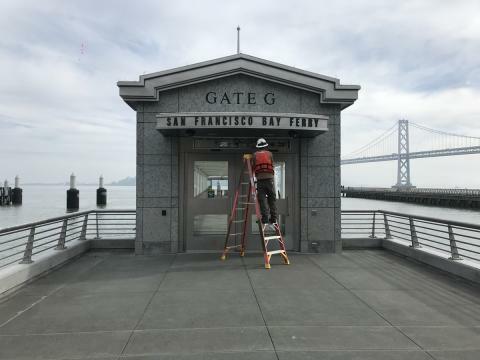 The electrical sub completed their last installations of lights on the Gate F Portal, while the contractor finished installing stainless corner pieces on the Gate F Portal pedestal. 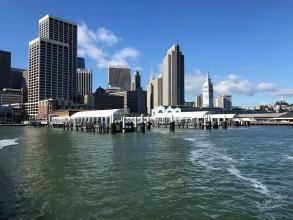 The glazing subcontractor was onsite installing waterproofing on the promenade canopy. 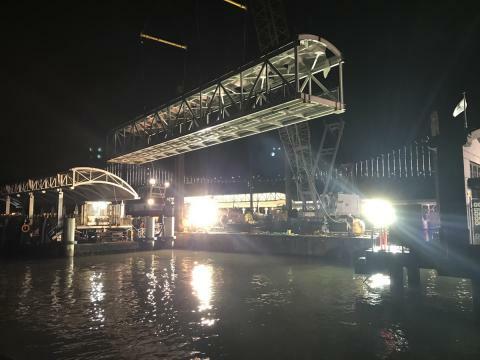 The metal subcontractor continued to install soffit panels on the Gate F and Gate G Portal Canopies. The paint subcontractor was onsite to paint the traditional handrail on the promenade. In the lagoon, the contractor began installing the falsework for Deck Pour #16. Over the next several weeks, the contractor is scheduled to place formwork for Deck Pour #16 in the plaza, pour concrete for Deck Pour #16, and completing punchlist items related to the Section 1 opening. 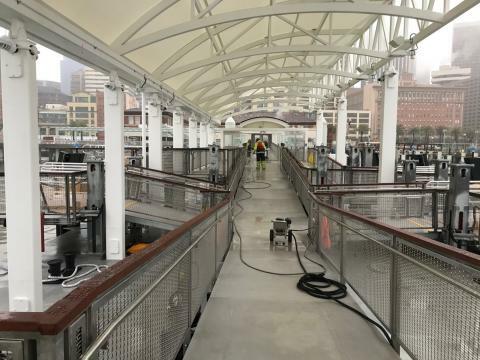 February 8, 2019: This week work on Gate F Terminal continued, including sanding and staining the top rails on the float and gangway and paint touch-ups on the pile collars and fenders. Additionally, the electrical subcontractor began installing conduit in the portal canopy at Gate G for the electronic real-time sign, the glazing subcontractor was onsite installing waterproofing on the promenade canopy, and the metal subcontractor continued to install soffit panels on the Gate F portal and began preparations for the install of soffit panels on the Gate G portal. In the lagoon, the contractor began installing the falsework for Deck Pour #16. 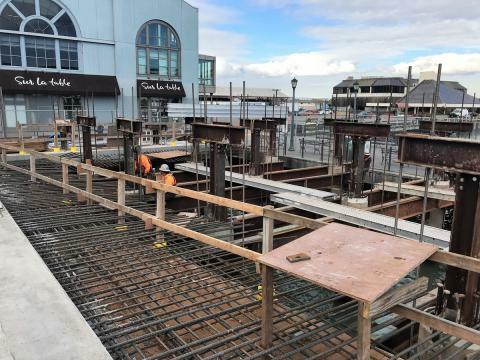 Over the next several weeks, the contractor is scheduled to place formwork for Deck Pour #16 in the plaza, pour concrete for Deck Pour #16, continue work related to opening Gate F, and continue work on the punch list items related to the opening of the promenade.